About a month ago we were walking with Izzy and Grant when we saw a disassembled crib outside of our neighbor’s house. 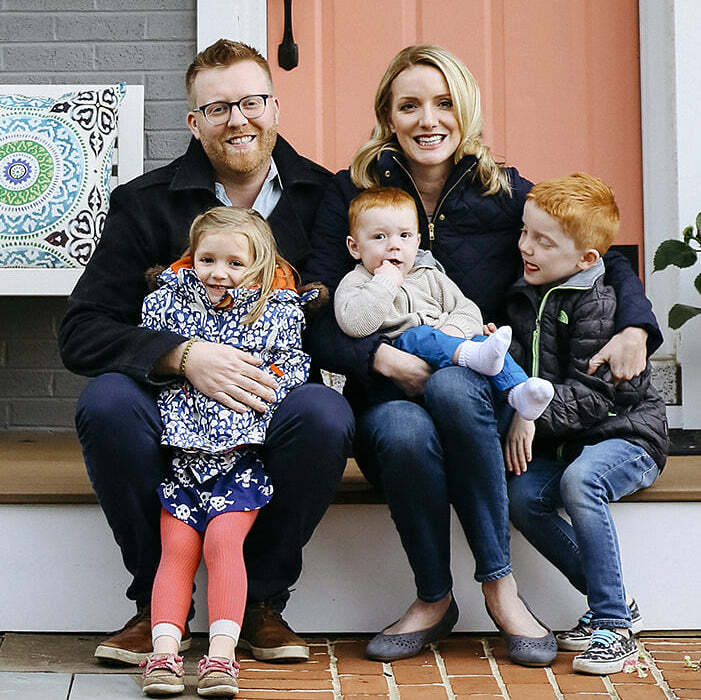 They yelled out the window, “It’s yours if you want it!”, and thus, two people we’ve known since July, were the first to find out we were having a second baby. They bought the crib on Craigslist, so we are the third owners, and it had its fair share of scratches. I’ve repainted a lot of furniture though, so it was well worth doing for a free crib. We’re still a few months away from needing the second one, but while we’re moving Grant into a new room to redo the floors in his old bedroom, we figured it was a good time to decorate and paint. He’s getting the new crib, which converts into a toddler bed. Benjamin Moore’s Aura is the same paint I use for cabinets, and it’s great for furniture. It hardens to an incredibly durable, enamel-like coating. There’s also no need to prime, it’s seriously a paint and primer in one. At $70 a gallon, it’s not cheap, but it goes a long way. I only used a half gallon to do all of my kitchen cabinets. 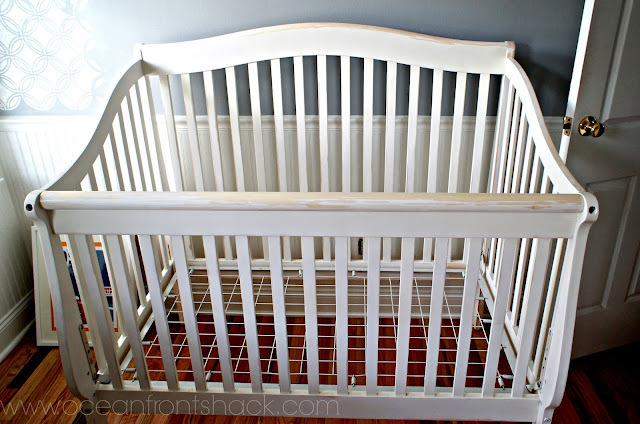 This crib probably took eight ounces. On Saturday morning Jason got out the orbital sander (heavy duty sanding isn’t something I can do pregnant) and went to town on the new crib. There’s no need to sand off all of the paint, but it’s important to get the surface smooth and remove any sheen for proper paint adhesion. There really isn’t much to painting furniture. 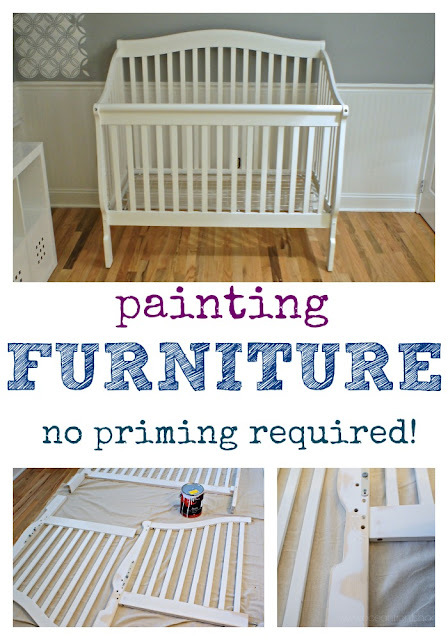 I used a Zibra edging brush on the crib because it’s a smaller brush that makes it easy to get around the slats, however, when I’ve painted things like dressers and tables I’ve always used a 2.5″ paintbrush. I don’t paint furniture with rollers because I like the look of brush strokes, it’s more organic than roller strokes, which can leave an orange peel texture. Even foam rollers leave something. I painted two coats on the sides of the crib that would be facing inwards when it was put together, then Jason assembled the crib. Painting the outside of the crib (the most visible part) after the crib was assembled made it easier to see and fix paint drips as I went.. Above is my “I can’t believe you’re taking my picture now, in sweats and no make-up” smile. I painted one coat, let it dry for an hour, then lightly sanded everything. Sanding before the final coat will smooth out any uneven paint or drips that may have occurred. You aren’t sanding very much, just smoothing any imperfections. 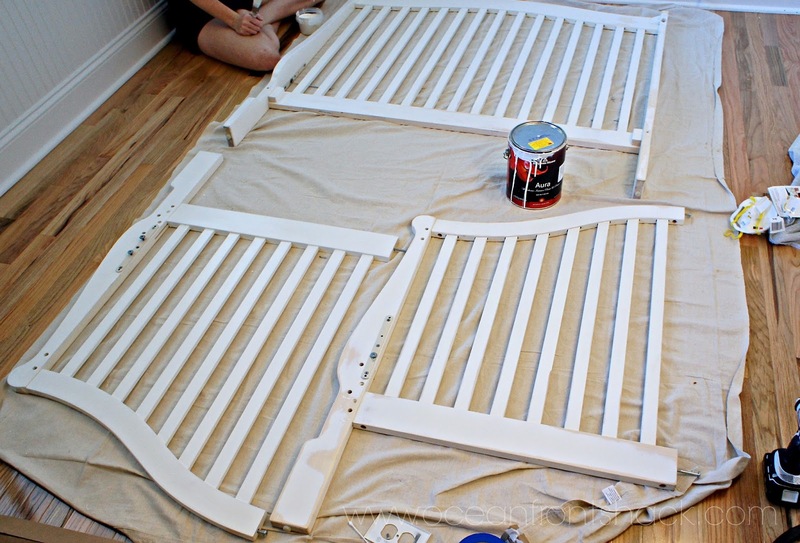 This was a white crib, so it only needed two coats. And we’re done! 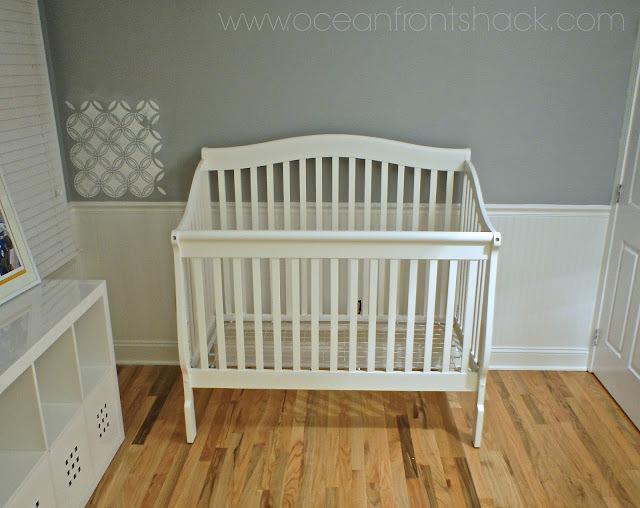 Not bad for a free crib, and we already had the paint so this project cost exactly $0. 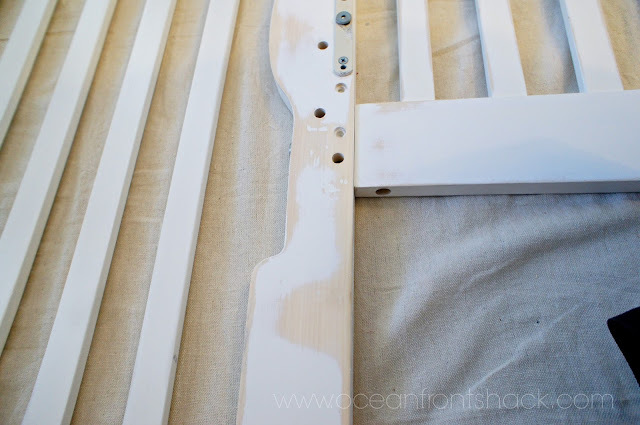 One piece of advice from personal experience: if you’re tempted by those Pinterest posts that say, “Painting Furniture, No Sanding Required!”, I’ve tried the Gripper primer method. Within a month my furniture was chipping and scratched all over the place. There isn’t a way I’m aware of to get around sanding. An orbital or mouse sander is only $25, though, and will make it go 100x faster. Also, I didn’t use any type of poly on this, but when I paint dressers I usually use Minwax Paste Finishing Wax. Polyurethane and finishing waxes are pretty toxic, so I don’t like the idea of using them on kids furniture, but they’re a must for anything with drawers. The finishing wax doesn’t leave much of a sheen, which I like, it generally leaves the furniture looking the same as before it’s applied, but adds an extra layer of protection. I hope that helps. If there is anything I can clear up, please feel free to ask in the comments section!